Written by Jenny Batting, one of our Obby Insiders. Insiders review all new classes to make sure they are as extraordinary as we intend them to be, so you know you are always getting a great experience when buying from Obby. I absolutely loved this class! The studio is part of a larger shared artists space (Kindred Studios) which is based near Maida Vale and super easy to get to. When I arrived Odile had a cup of tea brewing, and I had a chance to have a look around before the class started. 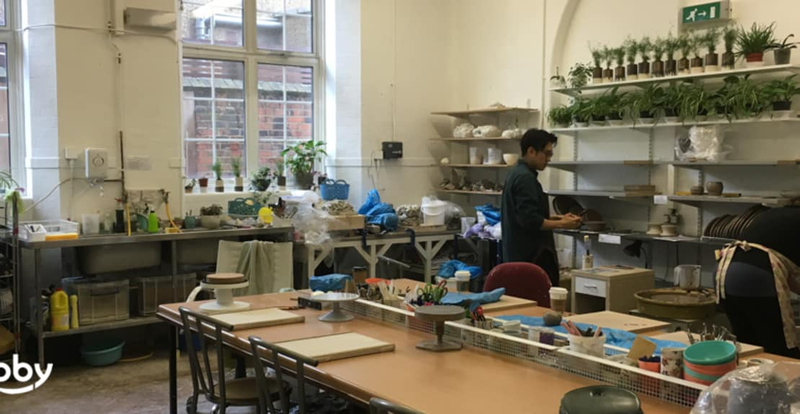 The studio itself is really lovely and bright and gives such a great insight into the inner workings of a full-time ceramicist. The class started with such an expert demonstration from Odile that I thought I would be picking up the wheel throwing in no time, little did I realise that her skills make it look a lot easier than it is (it's also totally mesmerising to watch)! We then spent some time cutting and shaping our clay into usable pieces ready to start throwing on the wheel. Of course, this was my favourite part of the workshop, and after a few failed attempts, and lots of help and patience from Odile, I finally got the hang of it (I think!) and managed to create a bowl that I was incredibly happy with. It's such a great feeling of accomplishment, and I can't wait to see the bowl once it's glazed and fired. Something I didn't know, glazing is basically like a light coat of paint, and Odile gave us choices on the colour - bonus! I left the studio with a big smile on my face and have definitely got the pottery bug. Thank you so much to Odile and Obby for the perfect Sunday - 5 stars!! !